If you want to be great at coding you need to move beyond the code and develop some essential skills for coders. To become a great coder it requires more than learning sequences of 0’s and 1’s or complicated programming languages. Anyone can learn a computer language, but the great coders, the ones who create game changing products, who truly excel in the field, possess far more than a knowledge of coding languages. They have a certain mindset that makes them imminently qualified for this technology field that is becoming increasingly dominant in our society. Before I start I need to throw something out there. Language is powerful and ever changing, with words often taking on many different meanings over time. Coder and Programmer are two such words. In this article I’m going to use the term Coder BUT the meanings and definitions… and the associated controversies, are fascinating to me and worth spending a little time researching. With that disclaimer, please read on and enjoy! Let’s chat essential skills for coders! Coding involves learning languages, specifically computer languages, but over time those languages change. What was a popular language 10 years ago may be obsolete now. Consider how much our phones, and touch screen apps, have changed over the years. Who knows what coding practices will be popular when our children are adults? This field is changing and growing so rapidly. Like learning languages, once a person learns one programming language, learning others becomes progressively easier. In the end though, coding greatness isn’t about which languages you know, but about the specific mindset and skill sets all great programmers must have to be successful. 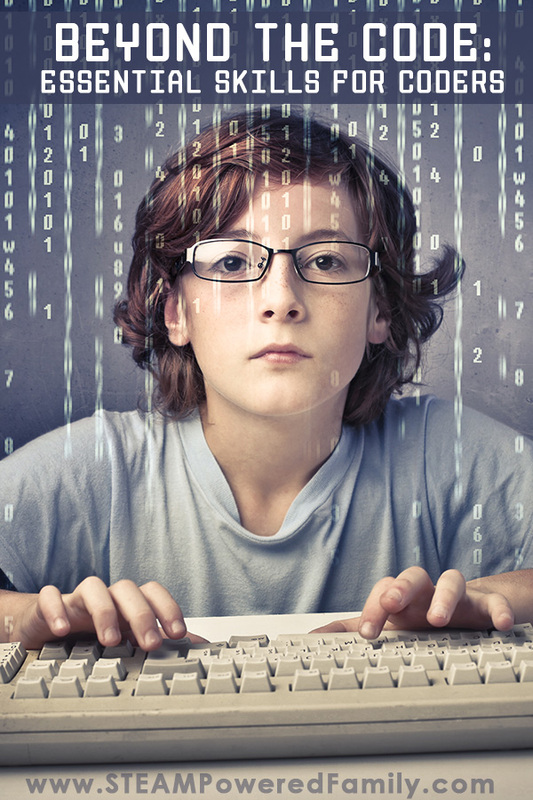 Here is our list of skills great young coders need to develop so they can grow into exceptional programmers. Pretty much anyone who is going to have a career at the keyboard needs to develop strong typing skills. After trying many different typing tools our favourite is Typing Instructor for Kids Platinum 5. It’s set up as a game, which my boys really enjoy. Coding is a finicky business. One missed colon will send your entire script into a melt down reminiscent of a 2 year old that doesn’t want to put on their socks. And like that 2 year old, your script will not help you pinpoint and solve the issue. Having great editing skills will help coders pinpoint errors and get those scripts wearing their socks and running smoothly. Tools that help develop editing skills could be Critical Thinking Co.’S workbook series, Editor in Chief. This skill is along the same lines as great editor. Having a keen eye that can pick up subtleties, patterns, and even colors is key. Some rousing rounds of Where’s Waldo, word search puzzles, and Boggle will help your child start developing an eye for details and patterns. Great programs, those amazing success stories that we love to read about, are usually due to a person’s ability to see a problem or need and come up with an effective and functional solution. The coding is just the execution of that creative process. A great way to explore this concept is to read stories of creators and inventors who saw a problem and found a solution where others had only struggled. Some of our favourite books are the Who Is series (Steve Jobs and Bill Gates would be great ones to start), when we want an inside glimpse into great minds. The ability to think out of the box and visualize how something will work will help coders find ways to successfully solve problems. To be able to look at a page of text and “see” what it will do is a fantastic skill. To do this have the child think of a program they want to create. Discuss what it will do, how it will do it, then draw pictures of what the finished program will look like. Critical Thinking Skills are extremely important for coders. Although they are limited by the strict requirements of the programming language, understanding problems and being able to dig down to the root of an issue will help them develop programs that truly meet and fulfill a need. Computers are very linear in their processing, so as a coder you need to be able to adopt strong analytical and linear thinking. Your mind needs to think like a computers does. If this happens, then this happens, but if this happens, then this happens. There are lots of different ways to build linear thinking skills perhaps playing chess or Robot Turtles (a game designed to teach early programming skills). Here at STEAM Powered Family we have also developed a number of fun packets that teach early coding skills. Check them out here in our Store or Teachers Paying Teachers. Becoming a great coder is about far more than learning programming, it’s about adopting a critical and problem solving mindset, it’s about creativity and attention to detail, and most of all it’s about the desire to solve a problem and fill a need. 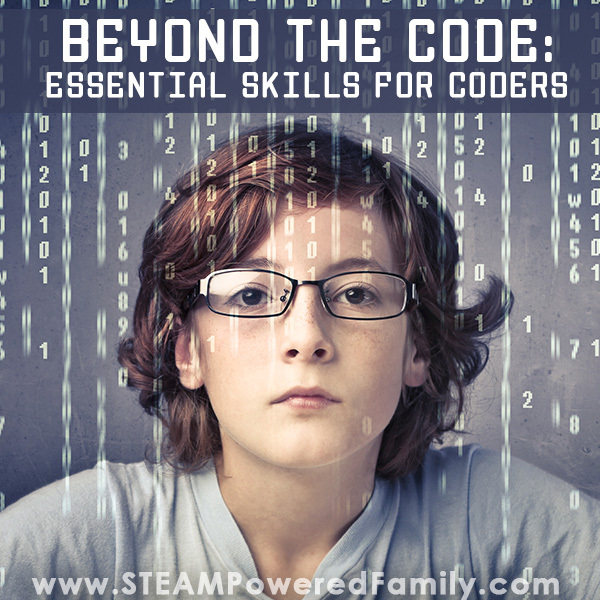 Go beyond the code and develop these essential skills for coders! Coding Cats & Coding Monsters – Making Coding Fun! Great post and tips (not just for kids)! Is this program for pre-schoolers? Absolutely you can teach preschoolers these skills. They are important skills that can be taught to all ages, simply ensure you are using age appropriate methods.